Civil war, fratricide, a city under siege and women in mortal terror – these are the themes of Aeschylus’ Seven Against Thebes, a tragedy that Aeschylus himself (or at least his persona in Aristophanes’ comedy, Frogs) boasted was "full of Ares" or martial spirit. This volume takes account of recent research on ancient warfare and of the intimate connection between war and Greek tragedy, which continues to speak to veterans’ experiences today. The chapters bring important new perspectives to this undeservedly neglected masterpiece. 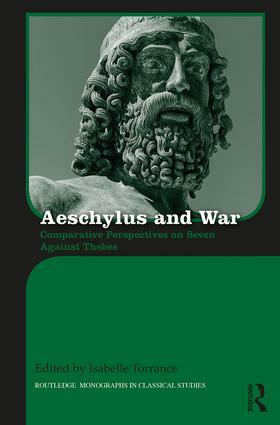 Aeschylus and War is a salutary reminder that Seven against Thebes must be understood in the martial context from which it draws its inspiration. Moreover, it is to be hoped that this useful and thought-provoking collection of papers will help to rekindle critical interest in a great and difficult work, which has for too long been condemned to brood sublimely in relative neglect. Moderated by Olivier Morel and Isabelle Torrance; prepared for publication by Isabelle Torrance. 9 Aeschylus and the Destruction of Thebes: What Did Apollo's Oracle Mean? Isabelle Torrance is Associate Professor and Research Fellow at the Aarhus Institute of Advanced Studies, Denmark. She has published numerous articles on Greek tragedy and its reception and is author of Aeschylus: Seven Against Thebes (London, 2007), Metapoetry in Euripides (Oxford, 2013), and co-author of Oaths and Swearing in Ancient Greece (Berlin, 2014).